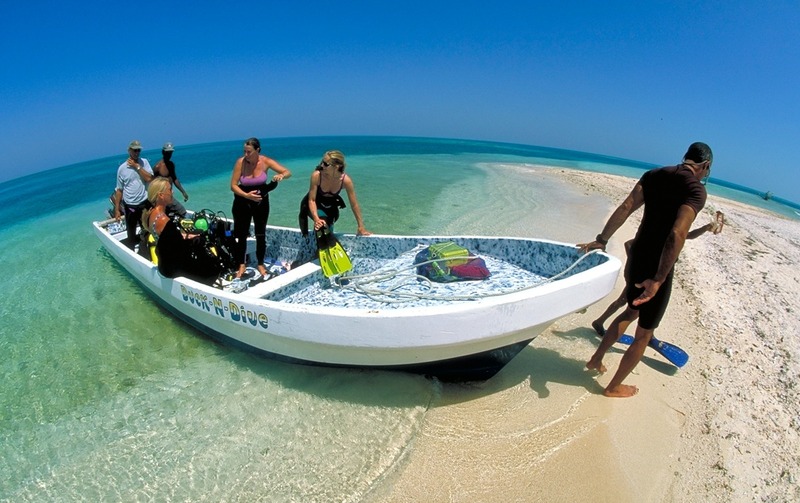 Our scuba school on Long Caye provides scuba diving lessons and PADI certification in Belize. 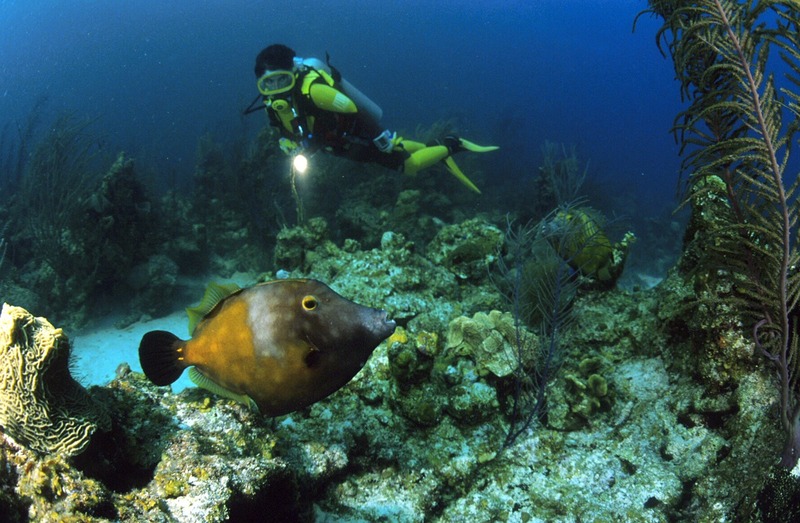 Our guests give rave reviews about our Belize scuba diving certifications. Nowhere else in the country gives as much individual scuba diving instruction for each dive student. Here you can earn yourPADI scuba certification tailored to fit your needs and schedule. 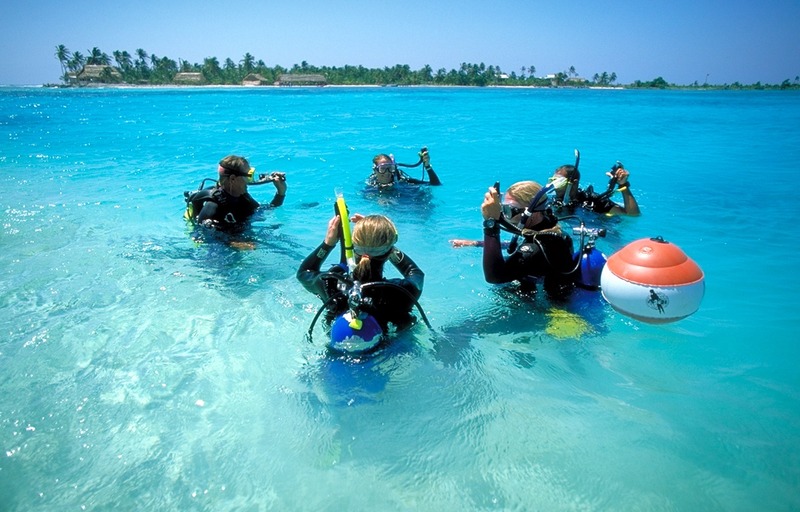 All certifications and dives are paid for on location, they are not included in the trip price. 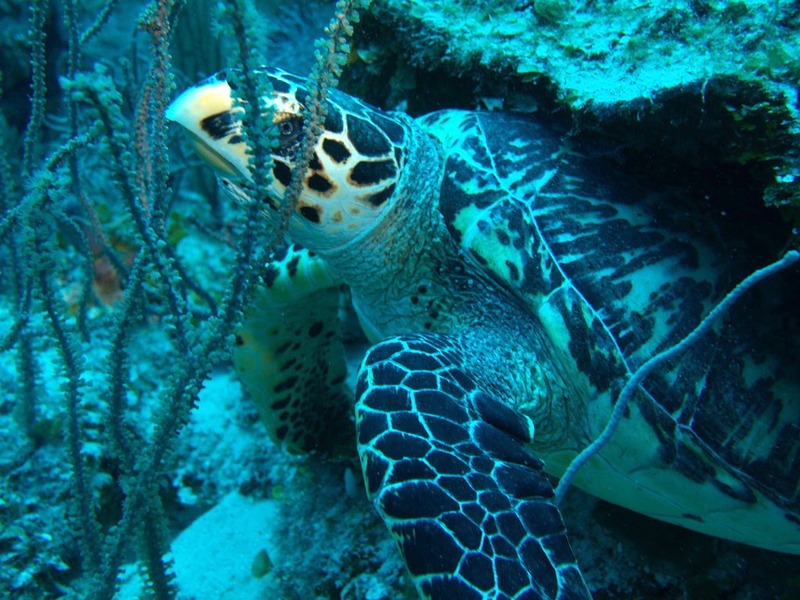 Please note that our Belize Adventure Week package as well as our Adventure Island at Glover’s Reef Second Half package are not long enough to get certified for scuba. You need to look at the Full Week or First Half Adventure Island at Glover’s Reef packages. About E-Learning Courses: Many people inquire about the online course, which is an option provided by PADI, that allows you to do the book work online (read the manual, watch a DVD, take quizzes and final exam) in advance of your holiday, therefore saving your holiday time for all of the sports we offer. The cost for the PADI eLearning is in addition to the prices listed here, there is only a $10 discount from the course price listed if you complete the eLearning before arriving. If you choose to do the PADI eLearning course, you are required to register online for your on-line coursework to apply toward your certification. Another option, which would allow you to avoid studying during your holiday, would be to purchase the latest PADI Manual from a local dive shop, and read it before you come. Then you just have to do is watch a DVD, take the quizzes, take the exam, and do the underwater work on the island. This saves you time from having to read the manual and study while on your holiday. This page contains information and prices for dive courses on our private island, which is 70 miles from Belize City. 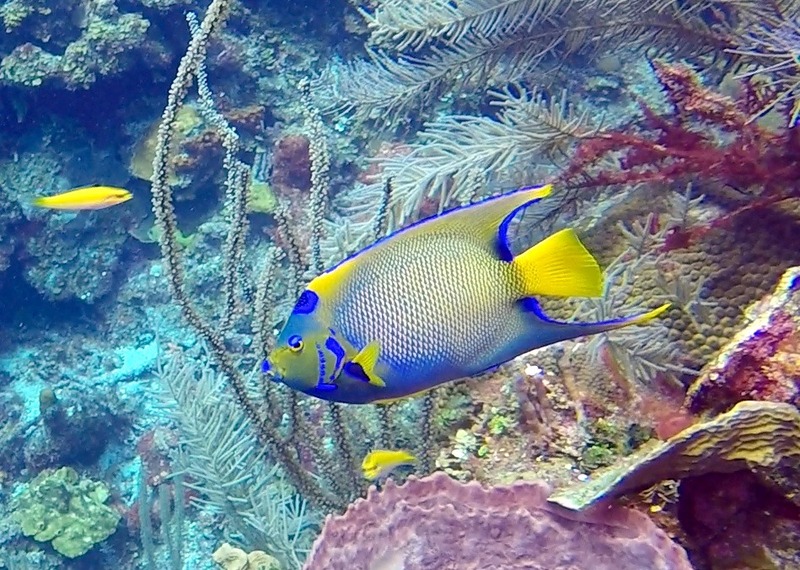 Diving at our island is not available without staying with us at our Belize caye resort. Our packages include hotels and meals in Belize City before and after the trip, transport to and from the island, accommodations and meals on the island, soda and beer on the island, and kayak, surfing, and windsurfing gear and instruction.We specialize in Belize multisport trips; we aren’t just a dive resort! For a complete summary of all the sea sports we offer, visit our adventure sports page. 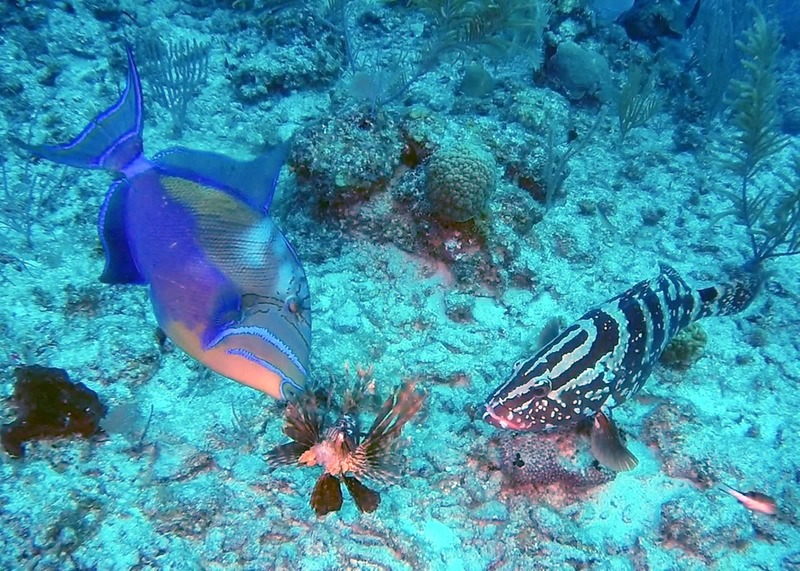 Our Belize dive courses are not part of the package, as the dive shop is owned by another couple. Guests dive throughout the week and pay for dives at the end of the week, on site. It is not possible to pay for courses in advance. -If only one person is interested in a course, the course is almost always available but not guaranteed (inquire for status). For example, if several courses are going on already and the weather turns bad, someone deciding to take a course at the last minute might not be able to be accommodated. Also the more advanced courses take more time and advance notice is needed. -All course dives and instruction are with a certified PADI instructor. Once you are certified you may dive with a Dive Master, which is governed by the certified dive rates table elsewhere on our site. -There is a 12.5% Belize General Sales Tax on all dives, gear rental, and courses in addition to the prices listed here. This rate could change without notice. 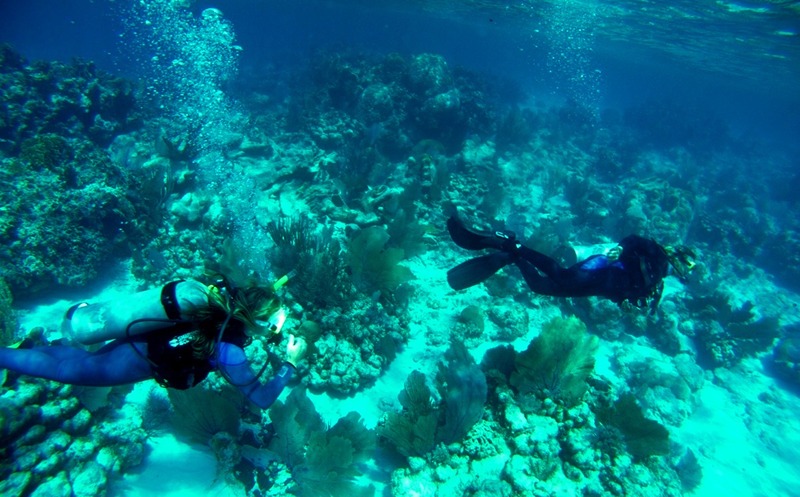 If you have never experienced scuba diving, this is the place to start. Before committing yourself to a more advanced course, make sure you like it! 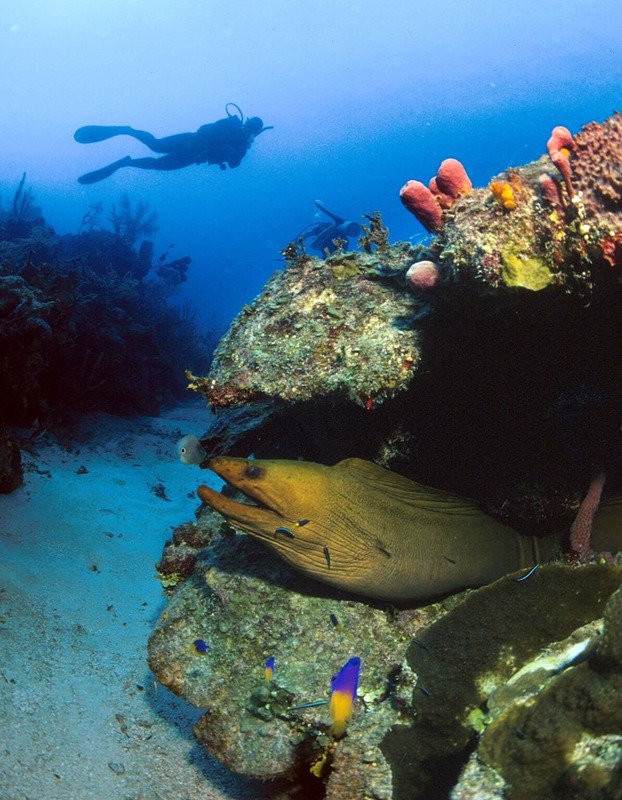 This short course combines classroom, shallow water skills, and a real dive at Long Caye Wall! The classroom time is about 1 hour. This is followed by very shallow water skills (less than 6 feet deep). The amount of time this takes depends on how big the class is and if anyone in the class has trouble… they take as much time as they need to get everyone comfortable in the water. The 25-40 foot deep dive lasts about 45 minutes underwater but you are probably gone from the island about 1 hr and 15 minutes during the dive. The Discover Scuba course allows non-divers to dive on Long Caye for the rest of the week without completing a longer certification course. After completing the course, you may continue to dive with an instructor for $85/dive, which includes BCD and regulator. 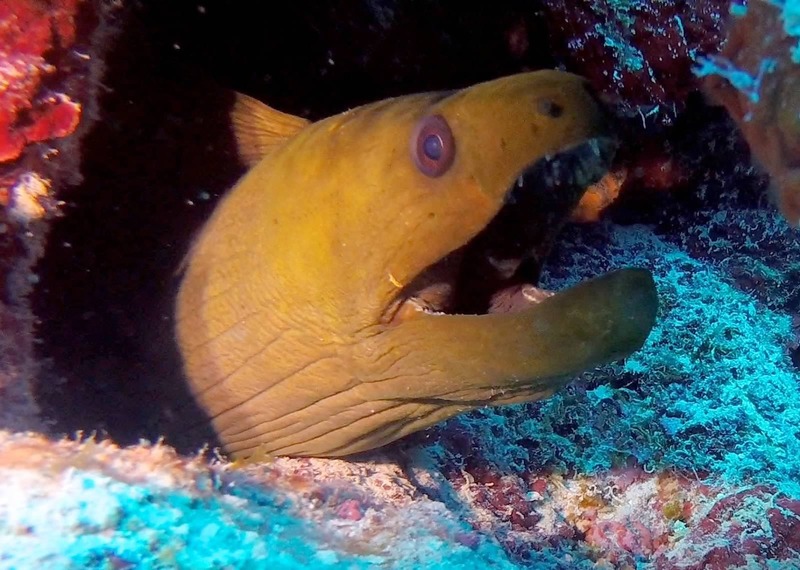 This does not transfer to other resorts, so if you left Long Caye and went elsewhere you would not be able to dive without taking the Discover Scuba course again. If you are a certified diver but have not been diving in a long time, you can take this course as a dive refresher course. If the course is already being offered to others, the will allow certified divers to sit in on the lecture portion for free. The Bubblemaker course is for kids from age 8 -9. This age group is restricted to a 6-foot depth and must be accompanied at all times by a dive instructor. This is the lowest level of certification that PADI offers. It is a lifetime certification, but has some limitations. You can dive world-wide, but you must be accompanied by a Dive Master, and there is a maximum depth limit of forty feet. Many people don’t want to dive without a Dive Master anyway, so that may not present a problem. 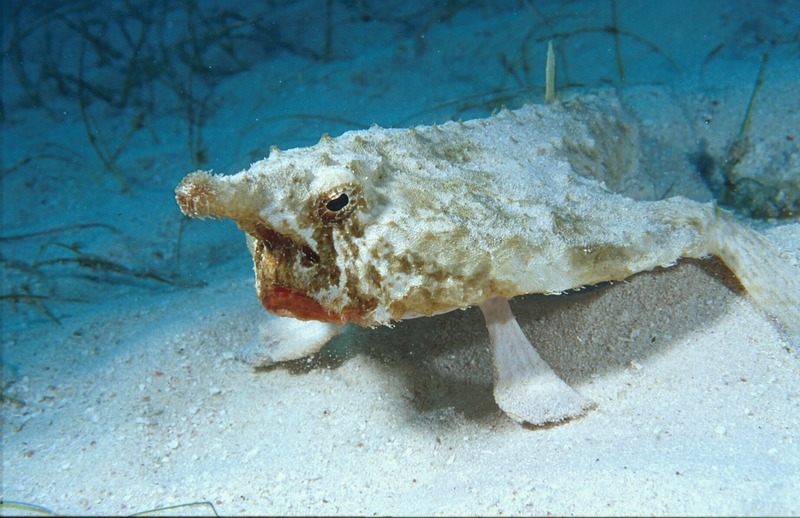 If you want to rent tanks and dive on your own back home, you should take Open Water Diver rather than PADI Scuba Diver. Our dive shop does not rent tanks; all dives are accompanied by a Dive Master. 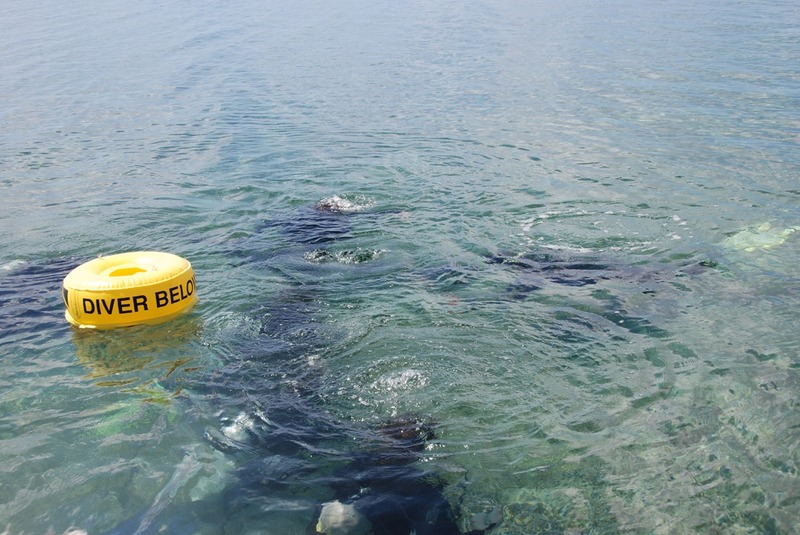 This course includes 2 open water dives. 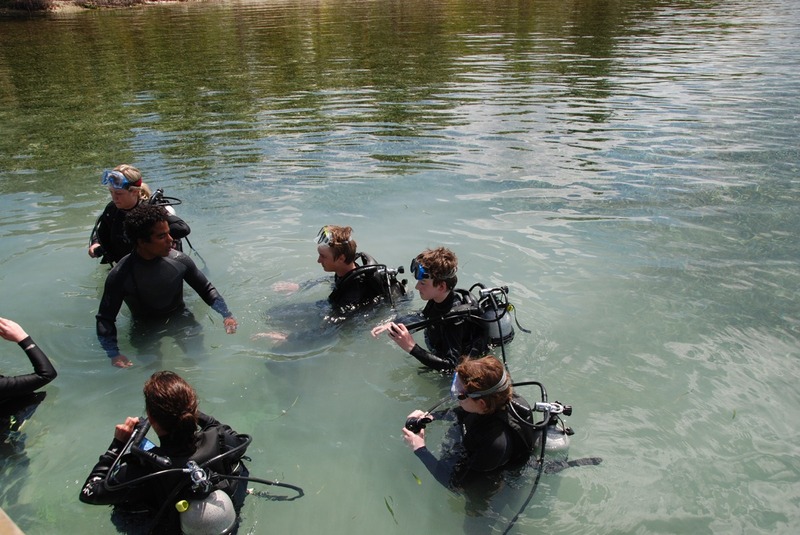 Students have the option to upgrade to full Open Water Diver at anytime after completion of the course. 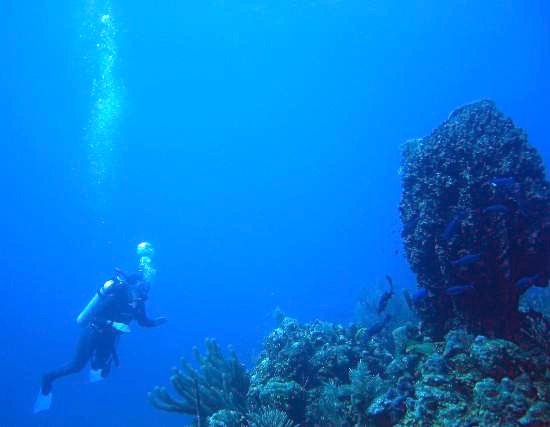 This course takes less time than the Full Open Water, and is a great option for those who want a certification, but intend to dive only at resorts where a Dive Master accompanies all divers. This is the standard certification for entry-level divers. 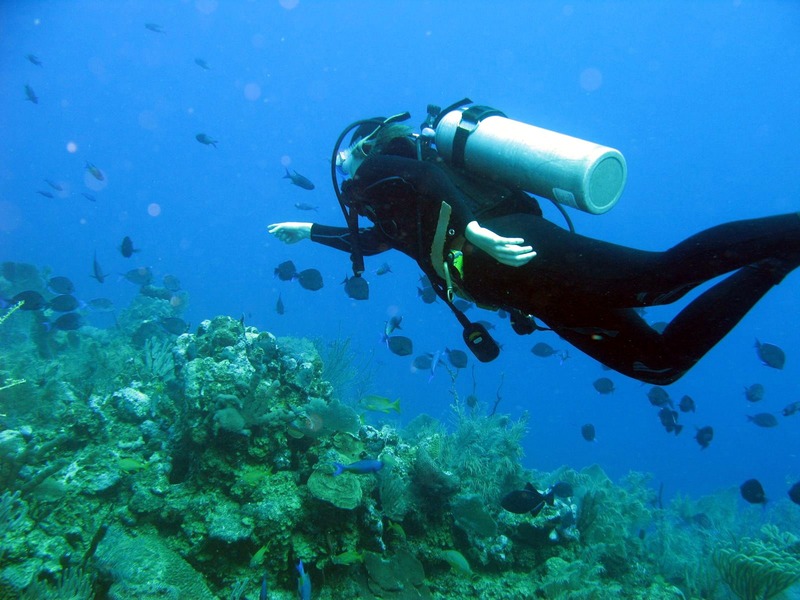 This course covers all fundamentals of scuba diving and is recognized worldwide. 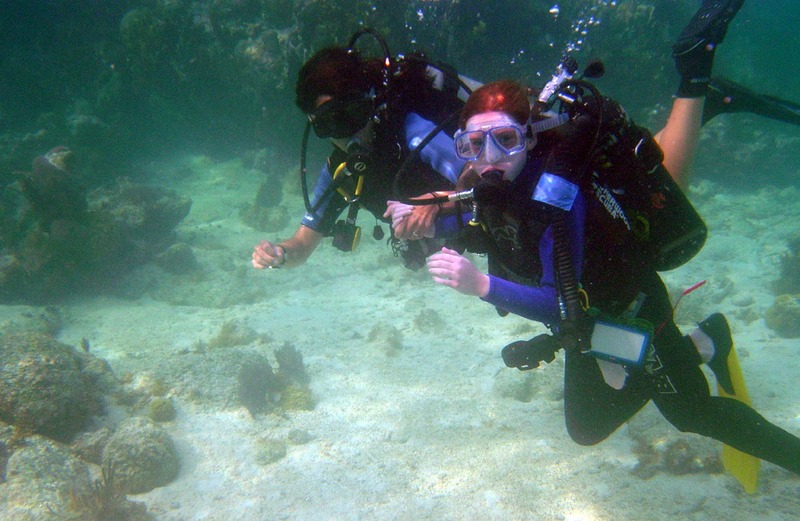 The course includes classroom work, five confined water training dives (demonstrating a mastery of skills in shallow water), and four open water dives. As a certified Open Water Diver you have the freedom to dive with a buddy but without a Dive Master present, although at Long Caye all dives are accompanied by a Dive Master. “Referral” courses mean that you finish your certification after classroom and confined water training have been completed successfully back home. You bring your paperwork from your previous PADI instructor with you that shows you passed your tests and skills, and simply finish your four course dives on the island. This is a great option, no studying for tests while on vacation! You must have already completed the Open Water Diver course to take this course. This course includes 3 elective dives. Adventure Diver is a lifetime certification course. It is not required to become a Dive Master, it is essentially the first half of the Advanced Open Water certification level. So if you choose to take this course, when you get to the Advanced Open Water level, you will only have to take the second half of it if you have already completed Adventure Diver. The 3 elective dives which constitute the bulk of this course are chosen by you out of the manual. You choose the type of dive you are interested in. The skills covered on the dives vary depending on what dives you are doing. There is no classroom time included in this course, but each dive briefing is thorough to cover the skills you will be practicing. Each briefing will take about one hour, followed by the dive, which will also take about one hour. There is no studying necessary prior to the course. This course is required to complete before you can continue on to Dive Master, and is a lifetime certification. You must have already completed the full Open Water course to take this course. This course includes 3 elective and 2 core dives. If you have already completed the Adventure Diver level previously, you have already completed the 3 elective dives for this course and only have to complete the 2 required dives, which are Deep Dive, and Navigation Dive. 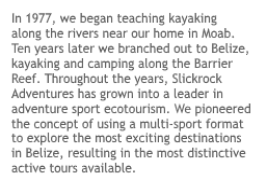 Please read the paragraph above about Adventure Diver. There is no classroom time for this course, but there are thorough briefings for each dive. Each briefing takes about one hour and then the dive itself takes about an hour as well. The skills covered in each briefing vary, depending on which dives you are completing. The Dive Instructor will go over skills needed for each specialized dive. Most people choose the Advanced Course in its entirety, all 5 dives, all at once, rather than take Adventure Diver first, and later complete the Advanced Course. However, the Adventure Diver is a good option if the weather doesn’t permit finishing, or if you get a cold, or some other reason that inhibits your ability to finish the full course while you are on the island. In that event, you would get the Adventure Diver level certification, and finish up the Advanced Course at a later date. If you do need to brush up on a little reading for a particular dive they have the manuals there on the island and you can read the appropriate sections on your own time. No advance testing or skills in a pool are required before you get to the island. This course must be arranged in advance. This is a performance based program and the duration depends on class size, logistics (such as weather), and candidate’s performance. How long does scuba certification last? Each PADI certification is a life-time license to dive anywhere in the world that accepts PADI cards. It depends on the level of certification, but the shortest course, PADI Scuba Diver, takes about 2 – 2.5 full days. I want to do the referral course, but my classroom and skill work will be with another organization other than PADI. Does your dive shop accept this referral so I can finish certification on your island? Yes, you can finish your certification with us, switching your completed certification to PADI, or you can carry home your paperwork stating you completed your certification with us and to send it into the other organization. It is more involved (and costs more) to switch over to PADI from the organization that did your initial course work, so it is more economical to take your paperwork back home. Can my kids take dive courses? Kids ages 8 and 9 may take the Bubblemaker course which has a 6-foot depth limit and takes one-half day. Kids who are already certified, who are ages 10 or older, can dive while here. 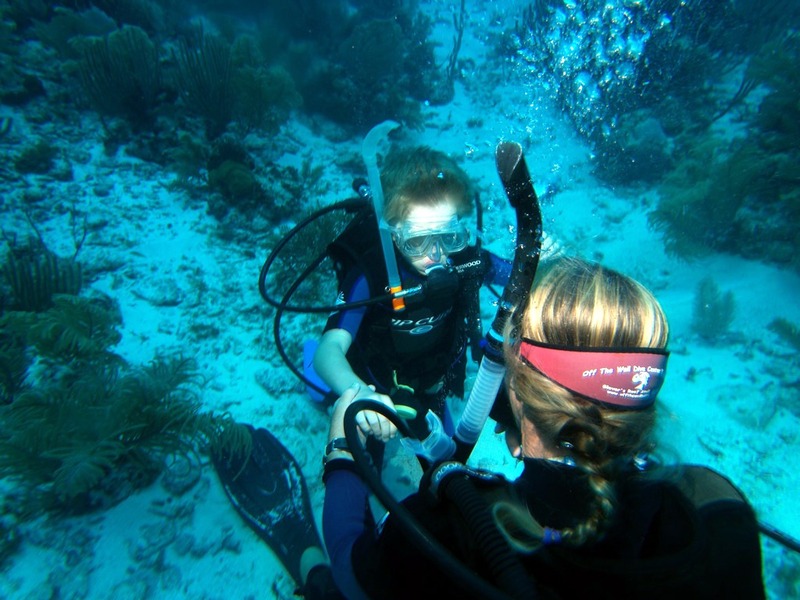 Kids ages 10 and 11 who wish to take a dive course with us, either Discover Scuba or a Certification Course, may be able to, if the parent/guardian feel the child is capable and if our Dive Instructor feels the child is capable. Kids ages 12 and over may take any course a beginner adult can take. If the child is in a dive course, he will not be able to dive with his parents until he is certified, unless the parents are also students in the same course. 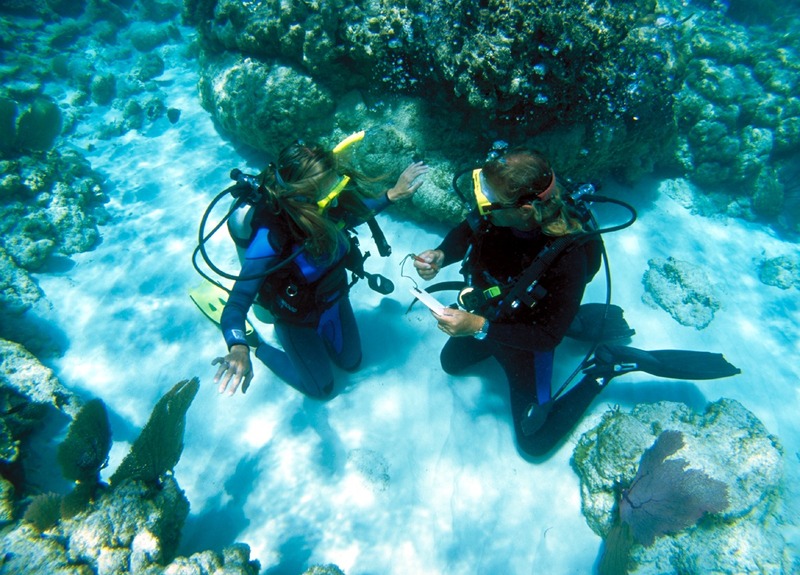 During courses students must dive with a Dive Instructor while certified divers dive with a Dive Master. The two groups may share the boat ride to a dive, but they will not be diving together. Also, when the student is doing skills with the Instructor, we have found in the past that having family members along who are just watching and not taking the course at the same time tend to distract from the lesson. After the course is completed, the child will be certified and then they can all dive together as certified divers. See paragraph below about required PADI Medical Form, which must be signed by a parent. Can my non-diving child ride along on the dive boat while I dive? Non-divers or snorkelers will not be able to join divers on the boat while divers are diving or taking courses. Therefore, single parents may not go scuba diving unless they have another adult in their party that can supervise their kids while they dive. The PADI Medical Form must be filled out by every new diver or dive student regardless of what dive class they are taking with us, or their age. This two-page form asks about many ailments and illnesses, and any “yes” answered on this form without an accompanying doctor’s signature will mean that guests will not be eligible to take any dive class with us. Areas of concern for diving fitness include: diabetes, respiratory problems, circulation problems, heart problems, major surgery, and asthma. 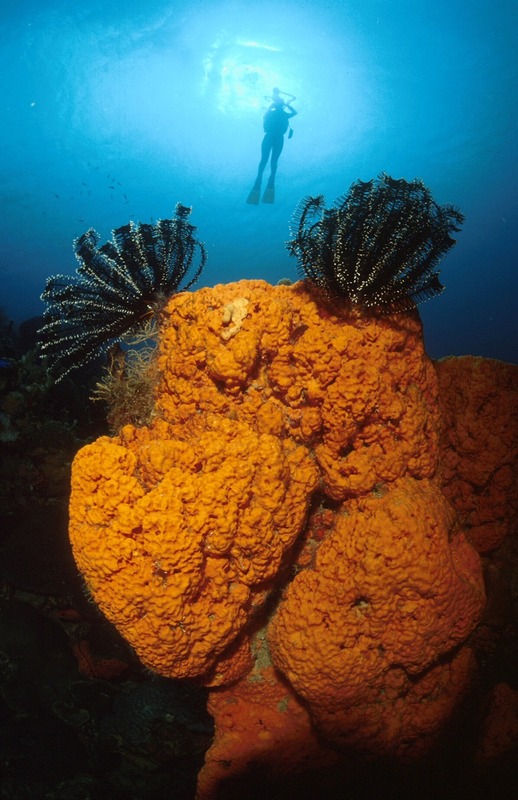 There are real risks of diving with certain medical conditions. If a person can honestly answer “no” to every single question on the form, then no doctor’s signature is required, and guests may complete the form when here. If a “yes” is answered on the form, a doctor’s signature is required, which would have to be filled out by the doctor and signed prior to coming on the trip. PADI does not require certified divers to fill out this form prior to diving, unless taking a class or if they have had a medical issue or change in health since they originally got certified to dive. If there are any questions at all, it is recommended you fill out the form in advance and get a doctor’s signature on the form if you want to dive and you have any possible medical concerns. A guardian or parent will need to sign all dive documents, liability releases etc for any child under the age of 18, prior to that child diving or taking a PADI course with us.